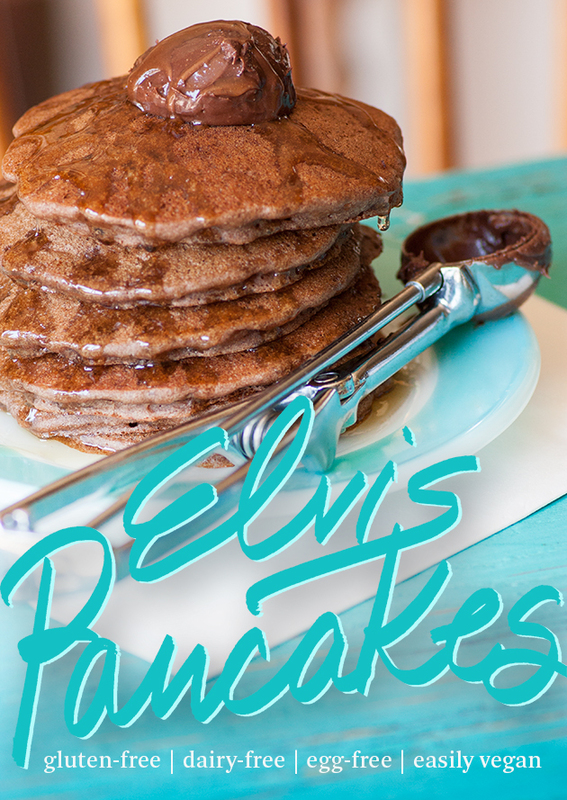 Hubby had left the chocolate peanut butter out on the counter—and there was my inspiration gluten free vegan Elvis pancakes. I love my mom’s peanut butter and banana sandwiches. She took this Elvis favorite to another level, making hers with my dad’s homemade gluten-full whole wheat bread (I’m salivating over the memory), a spread of mayo, peanut butter, honey and sliced banana. Elvis often requested a layer of crispy bacon on his. Oh my! Oh yes, please. One of Lexie’s Kitchen’s most loved recipes is this one. This morning I wanted to change it up a bit—try something fun and different. Hubby had left the chocolate peanut butter out on the counter—and there was my inspiration gluten free vegan Elvis pancakes. If I hadn’t run out of bananas and had some crispy bacon crumbles, I really could have taken this pancake recipe over the top. If you don’t do peanut butter, I bet this would make a great replacement. Don’t have chocolate peanut butter? Any plain nut butter or sunflower seed butter should work just fine. Here’s one I often make. Add all ingredients EXCEPT FOR BAKING SODA AND BAKING POWDER to blender container. Add baking powder and baking soda. Blend 10 seconds or just until incorporated. Pour 4-inch round pancakes onto oiled, preheated 350?F griddle. When bubbles appear on surface flip and cook another 30-60 seconds. Oh my gosh woman, these look incredible!! I am drooling over here. Good golly Miss Molly these sound and look ahhhh-mazing. Okay, I know that's not an Elvis song, but the right era non? I love this recipe Lex. And I love the recipe that it's based on. We use it a lot. But what I love most is that scoop of chocolate peanut butter on top. I'm coming to your house for breakfast! Swoon! You've just become my pancake goddess. So that everyone in my house can eat them, I might try with almond butter and applesauce in place of the banana. Yum! I have had pancakes on my mind a lot this past week. When I can go back to eating bananas and peanut butter, I'll have to try my hand at these. P.S. I usually like your superimposed text on pictures Lexie, but for this one I keep reading 'pelvis pancakes'!